Lately I’ve been looking around at what other parks departments do with park data. What do they collect, what is it used for, and how do they share it, if at all, with the public? Here are a few cool things I came across from the New York City Parks Department. 1. 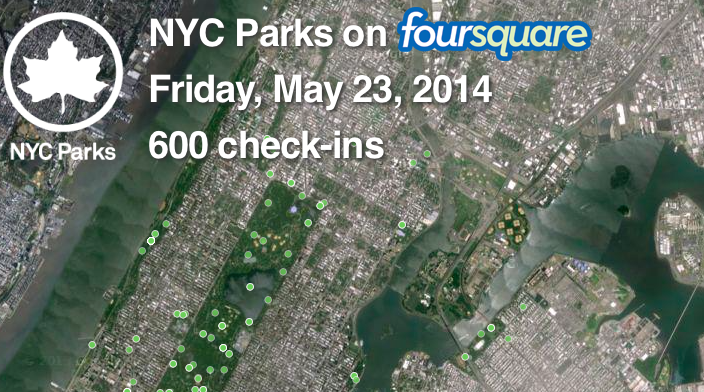 Whether you use foursquare or (more likely) not, check out the real-time check-in map for New York’s parks. Each green dot represents someone checked in to a part of a park, with a big green blob flashing up when someone new checks in. I’m not sure how useful this data is considering the highly selective group of people who use foursquare, but it sure is fun to watch. 2. NYC Parks also has a very detailed, public map of not only all its parks, but also all the things you will find in that park. You can zoom in and locate your favourite park monument, or the handball court closest to you, or the accessible entrances. It even has the plaza spaces created along Broadway and other streets. It’s a great planning tool, but also great for the public to just understand the amenities in their park system. 3. The third cool thing is maybe a bit nerdier, if that is even possible. The City’s Parks Inspection Program, which inspects parks for cleanliness and maintenance issues, publishes the results online. Before your eyes glaze over, let me tell you why this is great. It’s great because it allows residents to understand generally how their parks are doing and whether they are improving over time, which is hard to do just on your own walking through the park every so often. What would be really great is if more detailed data was also published on the different elements in the park: pathways, benches, garbage, etc. But this is a good start. Parks are public spaces and so it’s only fitting that the data that goes along with them is opened up to the public as well. How do you create a park that entices people to come out in a place where everyone has their own private backyard “park” to hang out in? You turn the park into the most awesomest backyard of all. With designs for a new waterfront park in Tulsa, Oklahoma landscape architects Michael Van Valkenburgh Associates are doing just that. 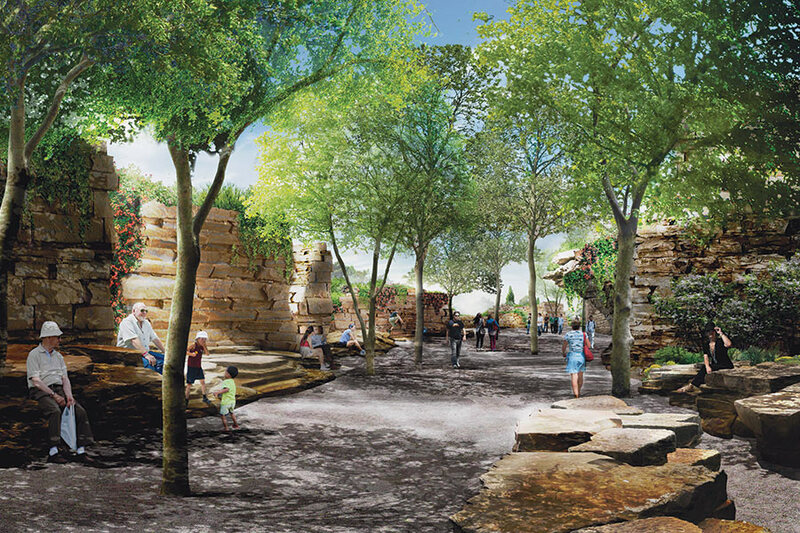 The park will feature tons of space for children to play in, but also BBQ and picnic spaces, and a “Lodge” with an indoor fireplace and an “informal beer garden nestled beneath a grove of trees,” says the Architects Newspaper. This made me think of something I’ve heard from a lot of people in Toronto lately who live in the more suburban areas of the city, which is that their parks need to offer them more of a reason to go there. Designing parks can’t just be about putting in a few benches, some trees, a lawn, and then sitting back and waiting for everyone to come running. Especially when you’re in a part of the city where a bench, a tree, and a lawn is what they have fenced in behind their own houses. Sure, maybe we can’t all hire MVVA to come and build us an “informal beer garden nestled beneath a grove of trees,” but top-notch design isn’t the only way to entice people to parks. Program the park with farmer’s markets or kid’s art classes or outdoor yoga or mimes trapped inside invisible boxes—whatever, every community’s different. But give that park a centre of gravity and people will be pulled in from the neighbourhood around it.